I took a long drive to Lost Lake, Oregon from Portland to photograph the Perseid Meteor Shower, the Milky Way, and Mount Hood. My goal was to use the lines created by the Milky Way and it's reflection to draw the viewer right into the center of the frame and Mount Hood. I also went for the inclusion of these two rocks on the shore of Lost Lake as anchors for my photo. 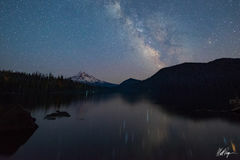 A meteor near the Galactic Center also added a nice aspect of dynamic interest in this nightscape fine art photograph.